Sturdy sawhorse project and improvements to pedal car plans. 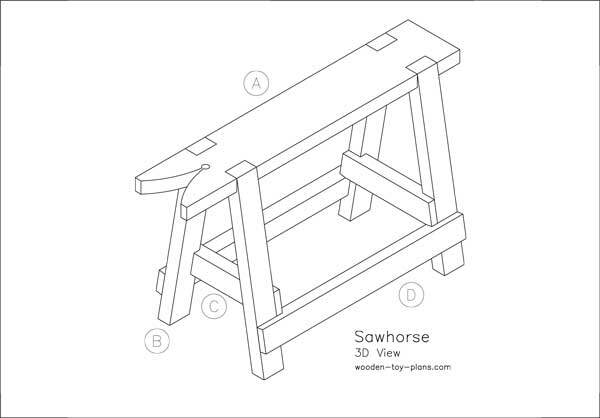 New sturdy sawhorse design features half lap joints for extra strength. Handy workshop helper you will wonder how you managed without one. Click here to get your free print ready PDF download project plan. I am working on a metric version of the jeep pedal car vintage plans that I found in the Popular Mechanics magazine. Also working on an idea for making a steering mechanism with minimal metalwork. For motive power, we are blessed with an abundance of battery powered electric motors, so why not use one? Click here to go the jeep pedal car vintage plans page.